Citation Information: J Clin Invest. 2014;124(7):2977-2987. https://doi.org/10.1172/JCI73174. Intracellular therapeutic targets that define tumor immunosuppression in both tumor cells and T cells remain intractable. Here, we have shown that administration of a covalently linked siRNA to an aptamer (apt) that selectively binds cytotoxic T lymphocyte–associated antigen 4 (CTLA4apt) allows gene silencing in exhausted CD8+ T cells and Tregs in tumors as well as CTLA4-expressing malignant T cells. CTLA4 expression was upregulated in CD8+ T cells in the tumor milieu; therefore, CTLA4apt fused to a STAT3-targeting siRNA (CTLA4apt–STAT3 siRNA) resulted in internalization into tumor-associated CD8+ T cells and silencing of STAT3, which activated tumor antigen–specific T cells in murine models. Both local and systemic administration of CTLA4apt–STAT3 siRNA dramatically reduced tumor-associated Tregs. Furthermore, CTLA4apt–STAT3 siRNA potently inhibited tumor growth and metastasis in various mouse tumor models. Importantly, CTLA4 expression is observed in T cells of patients with blood malignancies, and CTLA4apt–STAT3 siRNA treatment of immunodeficient mice bearing human T cell lymphomas promoted tumor cell apoptosis and tumor growth inhibition. These data demonstrate that a CTLA4apt-based siRNA delivery strategy allows gene silencing in both tumor-associated T cells and tumor cells and inhibits tumor growth and metastasis. CTLA4apt-siRNA uptake and gene silencing in T cells including CD8+ T cells. (A) CTLA4apt-siRNAFITC positive and negative CD3+ T cells were isolated by FACS sorting from tumors of mice (pools of n = 4) and treated as indicated. Stat3 mRNA levels were assessed by RT-PCR. SD is shown. ***P < 0.001. (B) Confocal microscopy indicating CTLA4apt–STAT3 siRNA internalization into CD8+ T cells. Scale bar: 5 μm. Insets were generated in silico by a digital zoom of the indicated regions of interest. 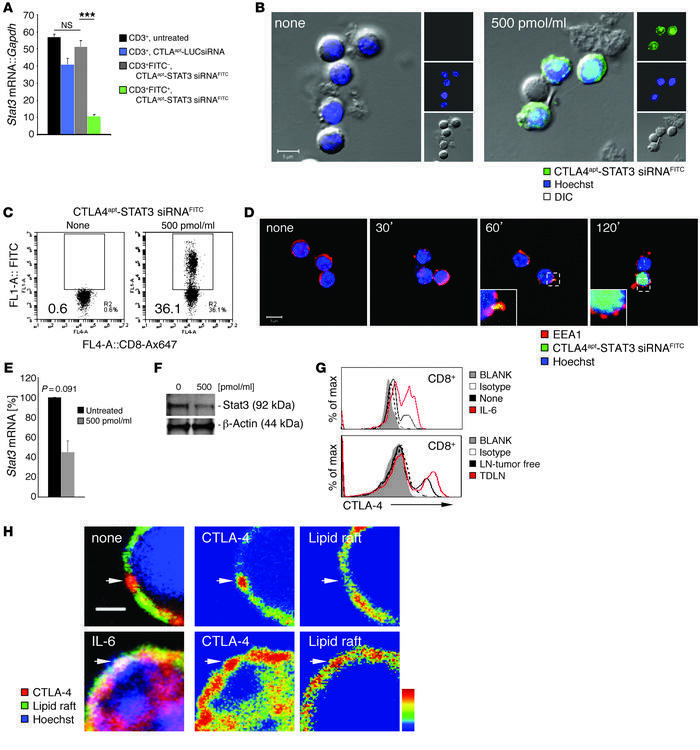 (C) Uptake of CTLA4apt–STAT3 siRNAFITC by CD8+ cells analyzed by flow cytometry. Gating on CD8+ T cells positive for CTLA4apt–STAT3 siRNAFITC after 2 hours of treatment. (D) Intracellular trafficking of CTLA4apt–STAT3 siRNA through endosomal compartments indicated by EEA-1 staining assessed by confocal analysis of CD8+ T cells treated for time points as indicated. Scale bar: 5 μm. Insets were generated in silico by a digital zoom of the indicated regions of interest. (E) Stat3 knockdown efficiency in vitro in CD8+ T cells by CTLA4apt–STAT3 siRNA. Stat3 expression analyzed by RT-PCR at RNA level or (F) by Western blotting at protein level from CD8+ cell lysates. (G) Upregulation of CTLA4 in CD8+ cells stimulated by IL-6 (upper panel) or in the TDLN (lower panel) as analyzed by flow cytometry. (H) IL-6 potently stimulates CTLA4 accumulation in lipid rafts. Single-cell suspensions were stained for lipid rafts and CTLA4 upon IL-6 stimulation and analyzed by confocal microscopy (left panel). Lipid raft domains and CTLA4 accumulations in lipid rafts upon IL-6 treatment (white arrowheads) shown in intensity coded false colors (red, high intensity; blue, low intensity; right panels). Scale bar: 2 μm.